1. Preheat the oven to 200°C, gas mark 6. If using fresh chestnuts, mark a cross in each one, spread out on a roasting tray and cook for 30 minutes. 2. Meanwhile, put the shallots in another tin and pour over the stock. Dot with the butter, sprinkle on the sugar and season. Cook for 30 minutes, stirring halfway. 3. Peel off the outer skins of the chestnuts and remove the white inner skin (rubbing them with a clean tea towel helps). 4. 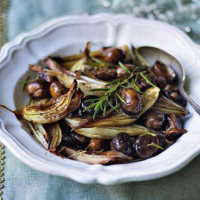 Add the vinegar, rosemary and cooked chestnuts to the shallots, toss well and return to the oven for 20 minutes until everything is sticky and glazed.